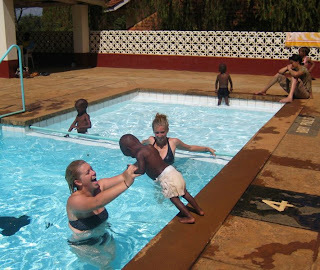 Yesterday, we went swimming with the kids from Sister Freda's. 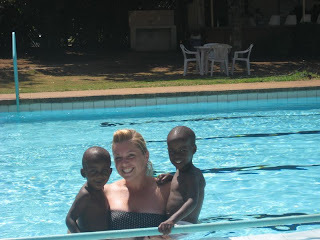 The babies were excited to be in the water...and so were we...it's been so hot here! Elia is learning to love the big pool, but he's still a little nervous to actually jump in so he would lean forward until I pulled him in. Dot loves the water more than anyone else. Moses and Morgan are jealous if one is in the big pool and not the other. 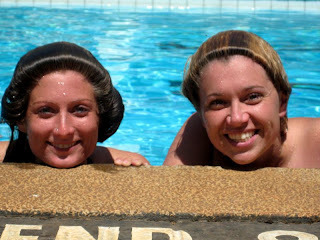 Since we pay to swim, we decided to get our money's worth...Daina and I, like a pair of 6th graders, jumped off the diving board over and over again for about twenty minutes... 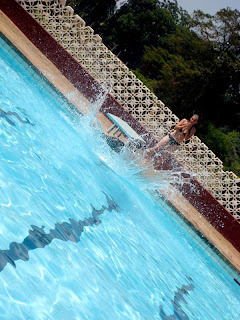 I didn't realize how slippery the diving board was, so on my first jump, I actually fell off...it hurt. I think that's the closest I've seen to a smile on Moses' face! He is beautiful!! !